The LS100THa is a telescope for observing the sun in H-alpha, a precision aligned ED refractor with 102mm aperture (no central obstruction) and 714mm focal length. 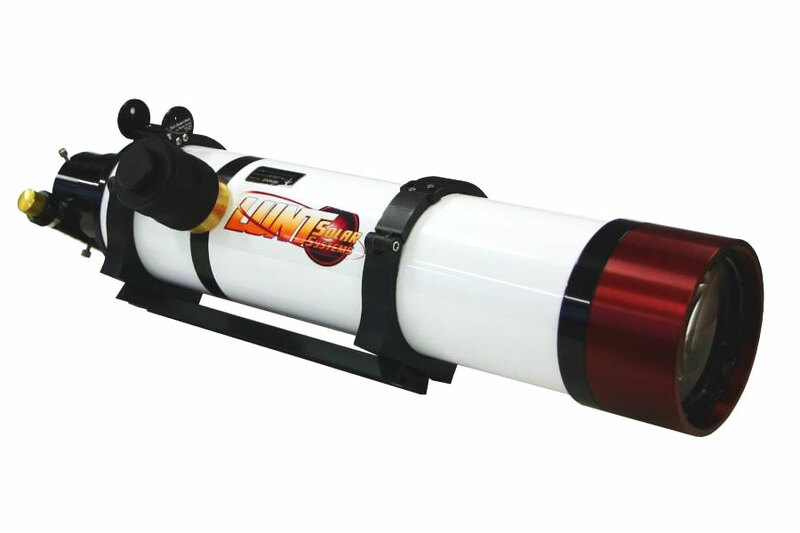 H-alpha Solar Telescope with 102mm aperture and <0.7 Angstrom bandwidth, with advanced air-pressure tuning system, and Feather-Touch focuser. Will be delivered without blocking-filter, can only be used with additional blocking-filter! This telescope will be delivered without blocking-filter. We offer many additional available blocking-filters in various sizes, in 90° star-diagonal, or straight extension-tube. You can use these blocking-filters at this telescope. PLEASE NOTE: You can not use this telescope without additional blocking-filter! The LS100THa is a telescope for observing the sun in H-alpha, a precision aligned ED refractor with 102mm aperture (no central obstruction) and 714mm focal length. An internal Etalon with advanced air-pressure tuning system “Pressure-Tuner” provides <0.7 Angstrom bandwidth. This “Pressure Tuner” system allows a more accurate Etalon adjustment than other systems. The “Pressure-Tuner” system adapted the Etalon to varying altitudes and atmospheric pressures for always optimal performance. The Etalon is installed safely inside the telescope-tube. Παρακαλώ ενημερώστε με για την τιμή του προϊόντος LUNT SOLAR TELESCOPE LS100THA OTA (NO BLOCKING FILTER), με κωδικό: OPT-0551400.